2. Note that the wood used is truly 'Magnolia' from Japan, which is a darker, heavy and hard wood rather than fast growing, light weight poplar wood often sold as magnolia. 3. The handle is round except for one ridge perfectly located on the upper right (as shown). This feels excellent in the hand and is popular with Japanese and western chefs. A great deal of attention goes into the handle and how it's attached to the blade (that's a buffalo horn ring holding the handle tightly onto the blade), and a precise final alignment. 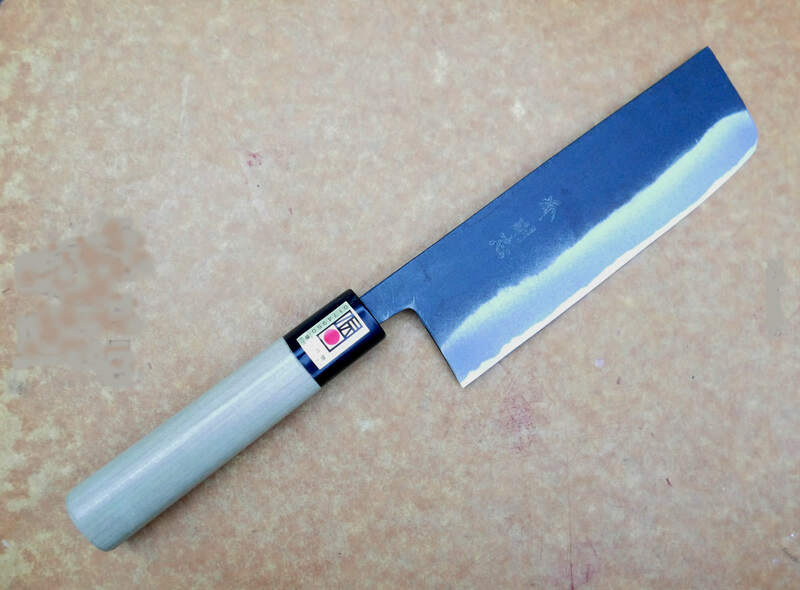 This is the 'Nakiri' style which is used for vegetables and various purposes. The style is called 'black finishing' as you can see the steel is worked a special way to give it a natural black look, on the top 3/4 of the blade. The black area is less likely to rust and maintains the look for the life of the knife. The knife is made of hard carbon steel, sharpened on both sides. The handle is Japanese Magnolia wood. The blade is 8.75" long, and handle is 6.25" long. Total length 15". Hand crafted by a master knife maker and sold to you at a very reasonable price, as we purchased direct. Similar knives are sold in Tokyo shops and abroad for much higher prices.